September traditionally hails the start of heating season, where thermostats click in, BMS systems relay information and commercial boilers fire into action to warm occupants feeling the first chilly morning of the autumn. The ‘Beast from the East’ may seem a distant memory, but it still serves as a reminder that when winter bites, it can be deep. This shines a spotlight on a building’s commercial boiler plant, and a greater need for efficient, responsive and flexible units. The latest commercial heating systems often include multiple heat sources, such as solar, heat pumps and CHP units. As a result, they are becoming more complex and reliant on efficient heat distribution throughout a building. These demands require accurate hydraulic balancing, which is often best achieved using a low loss header or buffer. However, systems of this type also demand a degree of flexibility and quick reaction time from integrated heat sources; therefore, the design of a commercial boiler unit must take all variables into account. Achieving a rapid reaction time depends largely on the design of a commercial boiler and, specifically, its water content. High water content (HWC) boilers are far bigger, slower to react and inflexible to the demands of a system. Low water content (LWC) boilers, on the other hand, respond rapidly – even in complex installations when combined with other heat sources. So, what does this mean in terms of numbers? Take a typical HWC unit with an output of 800kW, for example: the time taken to bring the mass of water from an ambient standby temperature of 10°C to a flow temperature of 80°C is 280 seconds. A comparable LWC boiler needs just 30 seconds, which highlights a considerable difference in terms of running costs. Indeed, units of this type significantly reduce gas consumption and start up/stand still losses, delivering huge lifetime savings compared to high water content technology. For example, a project with an 800kW boiler could offer an energy saving equating to tens of thousands of pounds over a boiler’s lifecycle. 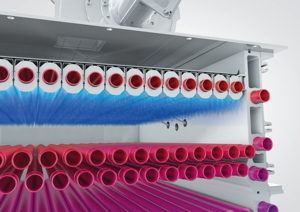 The water content of a boiler also has a dramatic effect on its construction. High water content units often have a heat exchanger which is cast or welded into one section. As temperature differences in the material are quite high, cast or welded heat exchangers don’t allow the mechanical stress to dissipate, and this can eventually lead to component damage. Low water content boiler design allows heat exchangers to be mechanically decoupled, using flexible seals and gaskets. Heat exchanger tubes can be mounted on O-ring seals, allowing them to move or expand under the influence of temperature changes. Additionally, several sections can be mounted together with gasket connections, reducing temperature differences and avoiding mechanical stress, even at higher Delta-T operation. The benefits of a low water content boiler design also extend to more compact dimensions and lower operating weights. These factors allow multiple lightweight boilers to be situated on rooftops or in rooftop plant rooms without the need to reinforce the floor. As a result, this can translate into significant savings of up to 50% during installation – especially when aspects such as transport, connections, pumps and low loss headers, are all considered. The days of huge leaps in condensing boiler technology are behind us, but that doesn’t mean incremental gains can’t still be found, which can accumulate into an overall improvement in performance. Take the design of a heat exchanger as an example. 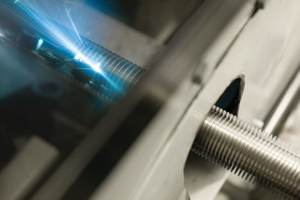 Maximising heat transfer is paramount, so at Elco we use laser-welded fin tubes, which provide a thin seam for the best possible heat transfer between tube and fin. Equally, using hydroforming technology maximises the surface contact areas for optimum heat transfer. These might seem like small factors individually, but combined, they can make a big difference in efficiencies. From an environmental perspective, careful consideration should be given to the emissionsproduced by gas condensing boilers. After all, they currently account for 7% of London’s NOx emissions alone. Consequently, building services engineers should specify boilers achieving the highest class of NOx emissions (Class 6). When specifying a commercial boiler, it is imperative to consider all underlying features to offer long term gains, especially as heating systems are becoming more complex, often involving multiple heat sources. As there will not always be a ‘one type fits all approach’, the overall running costs and carbon emissions of a boiler must be high on the specification agenda. In conclusion, specific aspects of boiler design, such as water content and the geometry of a heat exchanger, will have a major impact on a project – and will ultimately help determine its long-term success.